Reader MCWAV shares not only his first guitar body build but an original shape of his own design – a bold decision for a first time builder. So let’s have a look at his project. 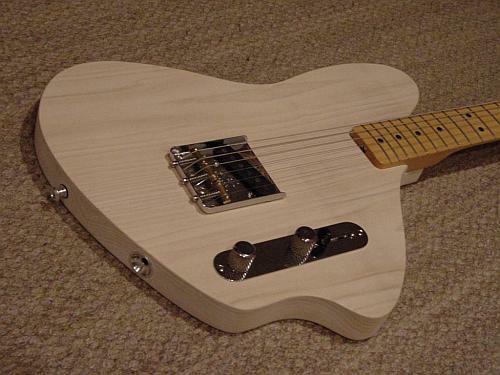 MCWAV opted for a straightforward configuration influenced by the Tele Esquire. Included are a single bridge pickup, a vintage style 3 saddle bridge and a 21 fret Fender Genuine Replacement Tele neck. 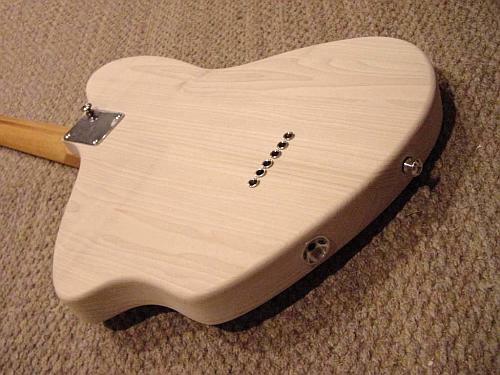 The guitar body is made from a 2 piece poplar blank. While we haven’t seen a lot of poplar use in previously featured projects, it’s far from uncommon and sees use in both guitars and basses. It grows throughout the eastern United States and is easy to work with – the latter a consideration when first venturing into making instruments. Like most guitars or basses designed with ergonomics in mind, the seated playing position was a key element in arriving at an appropriate shape. In either case, the guitar sits well and allows the guitarist to sit in a relaxed position without the contortions many guitars require to achieve an appropriate playing position. Nicely done. Continuing the theme, the instrument’s wiring was also influenced by the Tele Esquire and includes a tele style switch plate, knobs and switch. So what does MCWAV think of it so far? He noted that he’s been playing it daily and really enjoying the comfort it provides. And while some of his friends may think it looks odd, we know better. After all, beauty is as beauty does. Glen, Thanks so much for your comments! As you noted, the strap button can be placed at one or the other locations no problem. It was someting I decided to do when I added the hardware. Just went with it, I may drill a hole before adding finish? Such a simple shape and the instrument is built out in an elegant simplicity. I bet it sounds really good. What’s the pickup switch for? Is there a piezo in the bridge or something? Thanks Marc! Marc Why Group? Dude you can play! I first wired the switch like an esquire. 1 postion had the PU going straight to the jack the 2nd position PU with tone knob added and 3rd position was vol and tone add uf cap. Did not really work for me. So I just wired it to the vol and tone and the switch acts as a kill switch in one of the postions, kind of cool, you can turn the guitar off. No piezo. I don’t have any sound clips yet. It sounds like a tele, IMO. 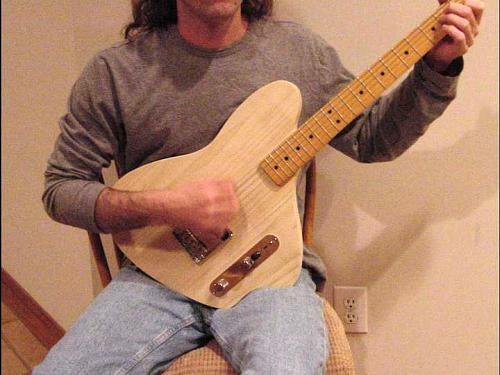 It sounds surprising like my tele swamp ash body with this same neck. Got me thinking the neck may just be the biggest factor in a solid body guitars over all tone/sound…..? Very pleasing to the eye! Looks like it could be slightly neck heavy sitting on the leg though; how is it in that regard? 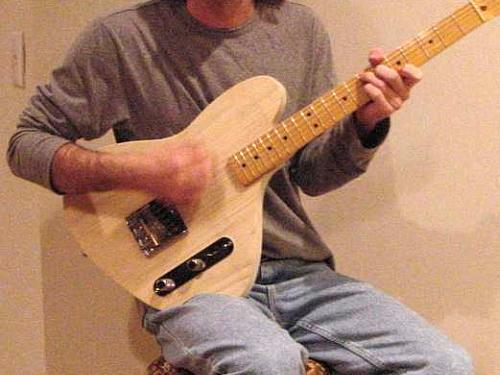 Does it have a standard Tele headstock?